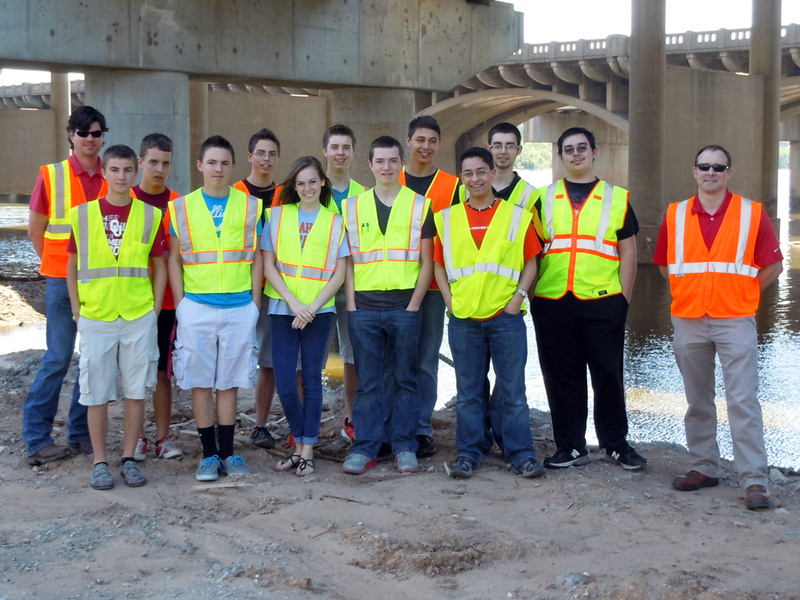 Pre-engineering students at Broken Arrow Public Schools recently toured Garver’s job site at the I-244 Westbound Multimodal Bridge over the Arkansas River in Tulsa, Oklahoma. Ms. Jalinda Hogan teaches the 10th graders through a program called Project Lead the Way, which is geared toward instruction in science, technology, engineering, and mathematics. Garver Project Manager Jason Langhammer, PE, gave the students an introduction to the bridge project, including the various design components of the structure and the design services that Garver provided. After the introduction, Jason led the 13 students and their teacher through the project site, stopping periodically to discuss some of the design challenges of the bridge as well as basic concepts of how the bridge was designed and constructed. "Seeing a constructed project of that magnitude gave the students a sense of potential pride they might have in their future engineering endeavors,” Jason said. “I believe this site visit gave them some motivation to further their careers in engineering."